Colleen Atwood is ready for the world to see another classic story come to life through her designs. The Oscar-winning costume designer's impressive resume includes everything from Chicago to Memoirs of a Geisha, though her longest-running partnership has been with director Tim Burton. 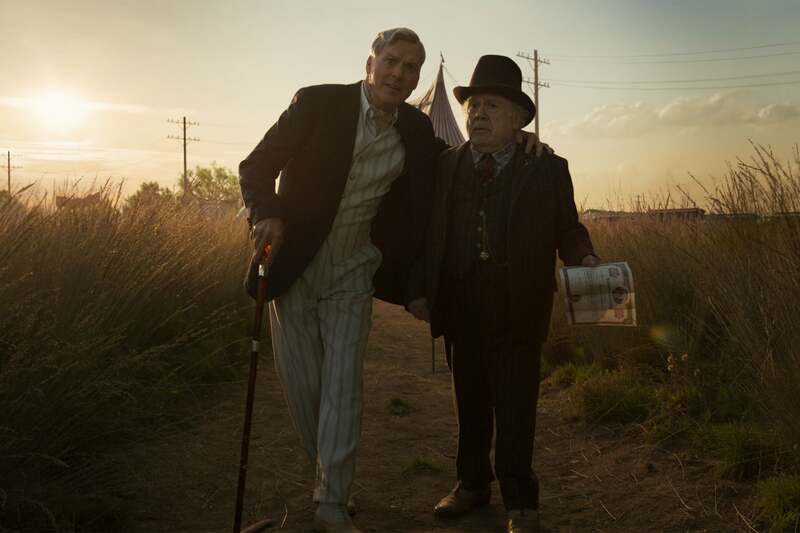 The two first worked together on 1990's Edward Scissorhands and following films like Sleepy Hollow, Alice in Wonderland and Dark Shadows, they have teamed up once again for Disney's live-action Dumbo, out now. "We just kind of hit it off visually in a way that works. I'm a huge admirer of Tim's art and his absolute ability as an artist to embrace other artists and let them do their thing," Atwood explained, revealing one reason they work so well together: "We don't really have rules. We try to avoid those!" Dumbo, based on the 1941 animated classic, is the story of an adorable elephant whose plus-sized ears give him the ability to fly. Ahead of the film's release, Atwood spoke with ET about returning to her circus roots and designing costumes for the entire cast, from Colin Farrell to a CGI pachyderm. ET: Back in the early 2000s, you designed all the new costumes for the Ringling Bros. and Barnum & Bailey Circus. This seems like a full circle moment for you. Colleen Atwood: Yeah! It was interesting to approach a circus job again. I knew a lot about the actual performers, their process, and the world of the circus. Although the movie world is very different, it was good to have that sort of background and that experience. 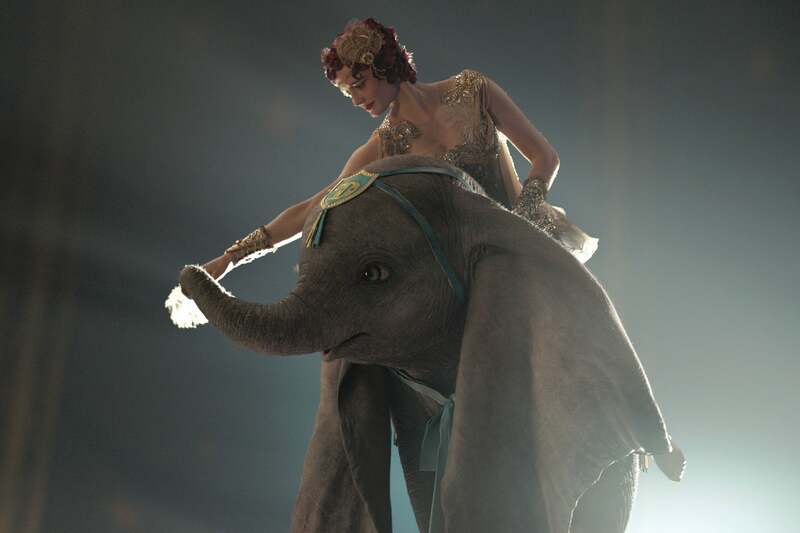 Circus colors are so varied, but with Dumbo, we wanted [the costumes] to have a patina. We sort of faded a lot of colors. It made them photograph in a richer, more nostalgic way. While designing the costumes, how much inspiration was taken from the original 1941 movie? The angle with what Dumbo sees and sort of the way he sees the world influenced me. Also, the scene with the clowns and the fire and all that was kind of a lift from the cartoon. I used the same shapes on the coats, hats, things like that, as a real kind of homage to the original. And Dumbo's little ruffle is similar. So, I took some Dumbo elements and put them in just to pay homage -- and because they were great. Dumbo is a classic tale that is now being introduced to a whole new generation of fans. With that in mind, was there an added pressure? The pressure, for me, was just making it really compelling and approachable to an audience today. It's always fun to design for children...because that's really a huge amount of the audience for Dumbo, I think. So, it was fun to do the kids clothes [for Nico Parker and Finley Hobbins] and make them have little circus elements and elements that made them a bit more special than just this straightforward kids dress from the period. I had fun playing with all those things. Below, Atwood breaks down how she costumed each of the characters in the film. Let's talk about costuming Dumbo. He's a computer-generated character, so what's that process like? How does it work? We had all different versions of Dumbo. We had a puppeteer [Edd Osmond] that was amazing, who helped make the elephant's movements. He had these eyeballs velcroed onto a green suit so the kid actors could see the eye line for Dumbo in order to relate to him and see where he was. Then we had two statuettes of Dumbo that we dressed. We actually made the costumes on those, so visual effects [department] could scan them and they'd be realistic, to look like real clothes on an elephant. You've mentioned that the point of view of Dumbo (and the camera angles) played a major role in your design process. In what ways? Because Dumbo is coming from the ground, sort of looking up at people, I concentrated a lot on interesting footwear and little details like Eva Green's shoes with the feathers and she has a feather motif on her stockings. So, when Dumbo discovers that feathers [help him fly], it makes sense. There's those little surprises, [those] Dumbo point-of-view sightings, throughout, [and] that is probably the most featured one. Everything you created for Eva Green's character is spectacular, especially the intricate details incorporated into her performance pieces with accessories to match. You really do feel like she's the star of the show. 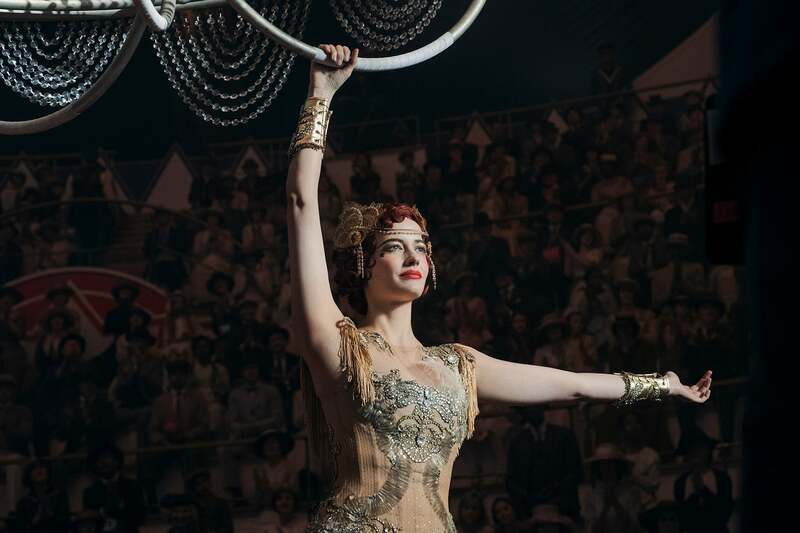 What inspired me for her was the old silent movie stars and the glamour of that world for her everyday clothes, and then the high-art glamour of the most prestigious aerial acts of the time, [who] were probably the best-paid performers within the circus. So, their costumes were opulent, they were huge crowd-pleasers. The dropping the skirt idea came from the idea that a lot of times aerial artists had a cape when they came out. Eva actually came up with the idea, "What if I have a big skirt and I can just drop that?" So, we figured out a way to do these grand skirts that just come off and then underneath, she had a traditional, sort of aerial artist [costume]. She also had a rehearsal costume with a corset based on a picture I found in research. It was a [photo of a] real circus rehearsal corset for a trapeze artist. It was really stiff and I copied that for her, for when she first rides Dumbo. For those eagle-eyed fans, what secrets did you intentionally hide in the costumes? In all the aerial outfits and the showgirl kind of outfits for the circus, they're very corseted outfits but they have different panels that stretch and they're camouflaged, so that they can do all their aerial movements. Even though they look like a period costume, there's elements that make them very flexible. 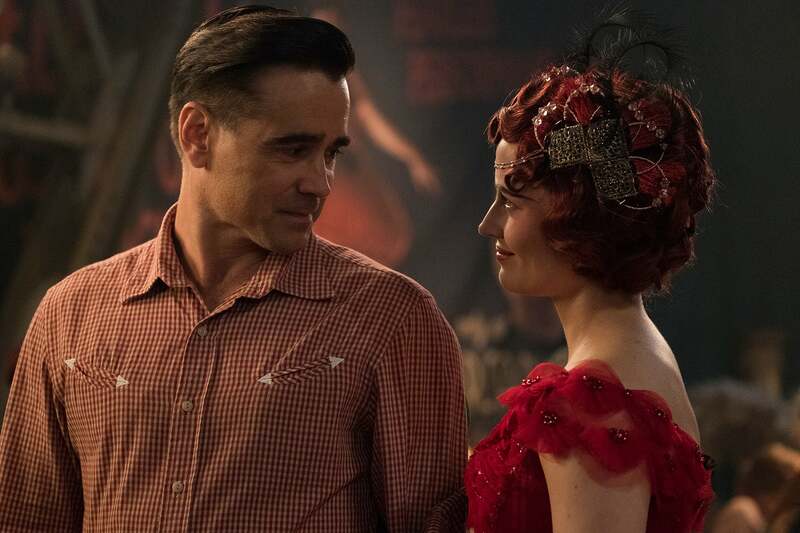 We learn that Colin Farrell's character lost an arm in World War I. Talk to me about designing his costumes and how you and the team were able to make that look realistic on screen. Well, the true reason it looks so good on screen is because of Colin. He really knew how to act not having an arm. It was funny because initially, we had all these conversations about how the arm is going to work. Then he comes in and goes, "OK, I'll just do this." He was very good at embracing that and solved the arm issue we had concerns about on his own. Can you explain why you costumed Michael Keaton, who plays Dreamland owner V.A. Vandevere, differently than the other characters, like Max Medici (Danny DeVito)? Michael's character came from New York, where he was living. He had one leg in showbiz and one leg in banking. He had to be presentational enough for the bankers to believe he had some finesse but not quite as low brow as, you know, the poor ringmaster for a one-ring circus. So, it was really a nod [to] where he came as a showman and then translating that into being an impresario in New York City. We wanted to really show what a banker would wear [at that time]. Stripes, ascots, things like that. Longtime Burton fans know that Keaton also worked with the director on Beetlejuice. Because you put him in stripes in Dumbo, some are wondering if it's an homage to that film? Hell no! [Laughs] The things people come up with, it's just like, "Really?" There's a lot of stripes in a circus, that's all I have to say. 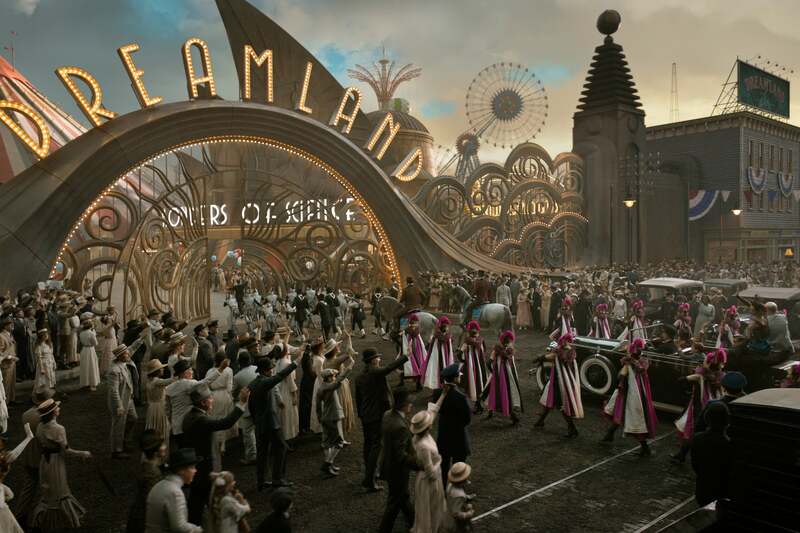 We have scenes like the circus parade, where hundreds of extras were involved. About how many costumes did you design for that, if you had to guess? For the movie altogether, I think I designed and made over 2,000 costumes. I made a lot of women's costumes for the crowd because for a couple of months on end, we had days where we had 500 to 600 extras. We also had circus performers, which was around another 120. And then we had the principal cast and all of the supporting actors. So, yeah, lots of costume making!